The 67 is a landmark camera designed for demanding professionals who need a workhorse in the field. Many years have passed since the introduction of the 67 and the most common comment we hear is "don't change a thing." 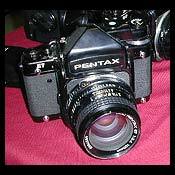 With an image area of 55mm by 70mm the Pentax 67 guarantees superior image quality. Easy to move to from 135-format SLR. Built like a tank, mirror lockup and DOF levers very helpful in composing. Great system accessories and lenses. Heavy, expensive on used market. Reliable, accurate and suited for allmost every job. Especially in fashion, industrial and aerial photography. And pop or jazz concerts. The lenses with a build in shutter, are in some cases a good alternative to overcome the long sync speed. From a distance it looks like a 'normal' SLR. The photographer is more 'touristlike', wich can be an advantage. The camera feels comfortable, though it is not quite a featherlite one. The 6x7 format can be enlarged. When I do concerts i just have e 200 mm , a 100mm and a 47 mm. WHen cropping there is always a 4 1/2 to 6 format left, so it is like carrying about 6 or 8 lenses around.. .
A weakness could be the long sync speed, 1/30 sec. But like I said, someone can live with it. I've been using those babies for about 30 years. The lenses are outstanding. The f:4/45 mm is absolutely free of aberrations, much better than Hasselblad or Mamiya. It is nice working with this camera. I did architecture, publicity, fashion and theatre with them. And the Pentax 6x7 and 67's are unsurpassed in aerial photography. I own a wide range of lenses, the quality of these is outstanding. Now everything went digital I still use those camera's in case the quality of medium format is necessary. For this I use negative film and make the scans on a Flextight (Hasselblad) scanner. This is very cost effective, in stead of buying a new camera every 5 years, cost including softwareupdates and 'new hardware requierments' approx. $15.000 per year, my 'ancient workflow' costs about a few films and the some dough for the laboratory. When there's no work for the medium format, the lease for the digitals have to be paid each month. While the filmcamera's are for free in this case! For some people the flash sybc coud be a problem, it's 1/30. But to me that was not a major issue. In those seldom cases I took my Pentax 645 with 67 adapter. I had the bodies serviced every two years. The technicians always looked at me if I was kind of nuts. They had nothing to do but blowing a few dustparticles out of the housing and they had a short look at the shutter speeds. P.e. 1/1000 of a second was allways between 1/996 en 1/1002. There was simply never the need to adjust the shutter. The camera's faced seawater, deserts, rain, snowflakes, the freezing cold (had to put the batteries in mij pockets to keep them going) and tropical heat. Rain forests. And they still live. After 30 years of experience with these ones and with Mamiya RB 67 and Hasselblad I can say: the quality is bettter than other medium format camera's and much better than the digital ones. Great, fast, sharp, well made lenses, cheap system to get into. Crap prism finder shows onlt 95% of image, and the metered one shows only 90% Crap! Very basic camera functions, sufficent but not exactly up to date with year 2006! The Pentax 6x7 medium format slr is a compromise. It is big, heavy, and very very very basic. No lightmeter, max shutter speed of 1000th sec, basic water seals, partly plastic housing but mostly metal, etc. The normal unmetered prism is very dim unless in good light, the eye relief is poorer than most cheapo slr's, the screen is very hard to focus. The pop up magnifier is useful but nowehere near as good as others, it's quite a flimsy little bit of kit. The shutter and Mirror sound like BANG! but if you don't care then it's fine. The Shutter bounce will blu images shot at slow shutter speeds with long lenses on a weak tripod. You need a tripod to use this camera. The lenses are fantastic, very well made, heavy, and worth every penny. I bought my 6x7 Asahi model used in 2003. I have rented this camera quite a few times before that. I have also used the smaller twin K1000 camera. This camera is a great deal these days used. Prices online can be low for this camera, making it worth while. The image quality off of these still beats digital in some areas. This camera is basic to use and its light meter accurate. Its a very heavy camera. Its built like a brick and I've heard of stories of these being dropped from planes 1000 feet up into fields and still surviving. This is probably the cheapest way to get into medium format. I've also used the P 645. This is a true classic of a formidable camera! Right now i believe its getting a true renaissance and the prices are climbing up,in these digital times,i meet and see many young photographers who dont give a F..about Extremely expensive Digital cameras and instead enjoy to use this P67 jewel and even get money for it!? why? go see for urself... the prints are still used by many magazines world wide and the format 6x7 is a graphicprinters dream,so this camera still rules in the times of digital dictatorship!or should we say economical dictator ship? Buy it :try it.U and your clients will be more than happy!..USE film! BUT BUT... remember to buy a very rugged (heavy)Tripod and head(i use Bogen 3038 and 3047/3038 head and balls)otherwise the prints get blurred! Its so strong and sturdy-so why? A tank. Yeah way past its prime; don't bet the farm. My 67s shoot and shoot without complaint and deliver beautifully exposed chromes with the TTL prisms. If the lighting is difficult or I want to get creative; out comes the Sekonic for incident or spot readings. Macro in 6 x7 on Velvia 50; awesome. Haven't found any. Big,heavy, NOT weaknesses. I have two 67 bodies, both equipted with the TTL prism. Add a lens and it is heavy. Add the wood grip and it becomes hand holdable in daylight with ISO 100. I'm talking lenses up to 200mm. Landscapes are fantastic or course. What is overlooked by most is the macro capabilities of this camera. I use my 67s consistently for nature work; macro. Remember the TTL reads through the lens and automatically compensates for light loss and extension! The bodies are solid, rugged and reliable. Nothing fancy, no gimicks. Add a Beattie screen with a split image for more accurate focusing. The Pentax screen is less accurate due to less light. Fast, low cost and very responsive. For changing out Pentax to Beattie screen or just complete tune-up. Mamiya 645; Mamiya M7II (rangefinder) Rollei TLRs (love 'em). For macro Canon EOS; all three of their macro lenses on 1N RS, RT, 3 and Elan. I'm not comparing image size, just equipment. 1) Attractive price 2) New lenses can fit older bodies or vice versa. 3) Straight forward design 4) 55.5 X 70.5 cm negative 5) The camera doesn't have "Zeiss" written on it. 6) Pentax Canada still has parts for first generation 67 with mirror lock-up. 7) The electro-mirror lock up feature can be converted to mechanical mirror lock up, in order to save batteries. 1)Slow flash syn. @ 1/30th of a sec. 2)Not as "compact" as a Hasselblad. 3)Pentax Canada, no longer repairs 67's without mirror lock up. I have been waiting 16 + years for my first Pentax 67 camera. The reason as to why I waited so long, was because of the fact, that this camera is hard to come by in the used market. I have compared to other manufacturers of Medium Format cameras in the market, but none of them were as reasonably priced as the Pentax. This is a great camera. Whwn I upgraded my hobby from 35mm to medium format, Pentax 67 is my camera of choice. It was design like a 35mm on steroid. It works just like a 35mm. I did not have to relearn how to use the shutter, winder, wiewfinder, etc. The lenses are fast compare with the competitive products. The price is cheaper than the competitors too. Slow flash sync speed - You''''ll NEED the leaf shutter lenses for any flash applications. This is a great Medium Format SLR camera made for field work. It is NOT designed for the studio, although with 90mm and 165mm Leaf Shutter lenses, it can be used that way. The lenses are RAZOR sharp. My Velvias are noticeably better at large enlargement than any 35mm Kodachromes. The ergonomics for hand-holding are drastically improved when it is used with the optional wooden hand grip. Since my first purchase of a 6X7 I have used this camera for more than a year. I have also acquired several lenses, another body, and older TTL prism. Everything feels solid and well built. I love the format. Equipment is pretty heavy. I wouldn''t suggest it for backpacking. Film is somewhat tricky to load until you get the hang of it. This is an update of my previous review.